While we're usually discussing the latest and greatest in the entertainment industry here on NextGen Player, from time to time we like to call attention to campaigns out there that do a great job of bringing awareness to important issues in entertaining ways. 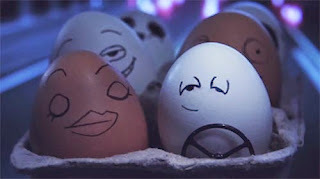 Arrive Alive's Eggs on Weed is one such campaign that has a great message, and presents it in a very humourous way. Eggs on Weed is all about creating awareness of the dangers of driving while high on weed, a topic that I admit I hadn't given much thought to. But after seeing a couple of the Eggs on Weed videos, this is an issue I've been thinking a lot about recently, partly because these videos are just so darn hilarious. To engage others on the topic of driving while high on weed, Arrive Alive has a funny photo caption contest going on now until June 5th. Come take a look at the Eggs on Weed videos, and contest details after the break! It's a really funny piece and the message is clear -- while one might feel like they can intently focus on driving while high on weed, you're actually 5x more likely to hit things. For more funny videos like the one above, and amusing bios of the weed-smoking eggs, be sure to check out the Eggs on Weed website. To help bring this message to a larger audience, Arrive Alive is also currently running a photo caption contest, with a grand prize of a free iPad Mini, that's on now and closes June 5th. They just uploaded a photo of the eggs that you can comment on, and the top three voted entries will be finalists in the grand prize judging for the iPad Mini. If you enter the contest, be sure to share with your family and friends so they can vote on your submission! Good luck to everyone who enters the contest, and be sure to let us know in the comments your thoughts about the campaign! This post content is sponsored by arrive alive DRIVE SOBER, however the views and opinions expressed herein are my own.